Thousands of supporters of the pro-independence Basque political party Batasuna, banned by a Spanish judge August 26, march September 8 in San Sebastián in support of Basque political prisoners. The march also opposed Madrid’s measures against Batasuna. 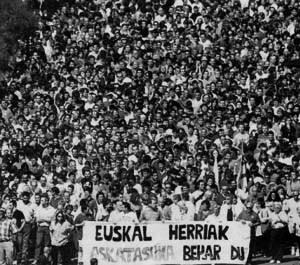 Government officials accuse the nationalist party, which has substantial support among the Basque population, of being linked to the outlawed group ETA (Basque Homeland and Freedom.) Many oppose the ban as an attack on the fight for Basque national rights.